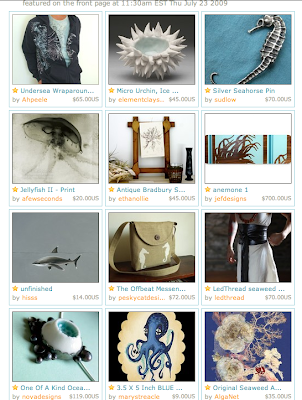 I just discovered that my Offbeat Messenger with a pair of seahorses made it to Etsy's front page today! Thanks to Etsy for selecting this treasury and thanks to Kira Ferrer for curating this stunning sea-inspired collection. You must check out Kira Ferrer Designs on Etsy. She creates the most beautiful and unique jewelry. I've had my eye on her shop for a long time. I love her Sea Anemone Stacking Rings and the matching Sea Anemone Studs. They are on my wish list. Today I also learned that I was featured on Karen Fields lovely blog. Thanks Karen! See the post here. Karen is a wonderful artist and her one-of-a-kind original paintings are available in her Etsy shop, Karen Fields Gallery. Her work is beautiful and the colors are stunning! Thank you Elisa for mentioning my Etsy Shop! You've created a beautiful collection of bags, Elisa! Hey Elisa, I love your new Juki, congrats! The new bags are looking really good. I like the flower power bag. You are definitely on a roll!! WOW, how many is that now? You are very talented and your bags are beautiful! You deserve every momment! What a great summer for Pesky Cat Designs! I am so jealous! In a good way..
Really you deserve it my dear !